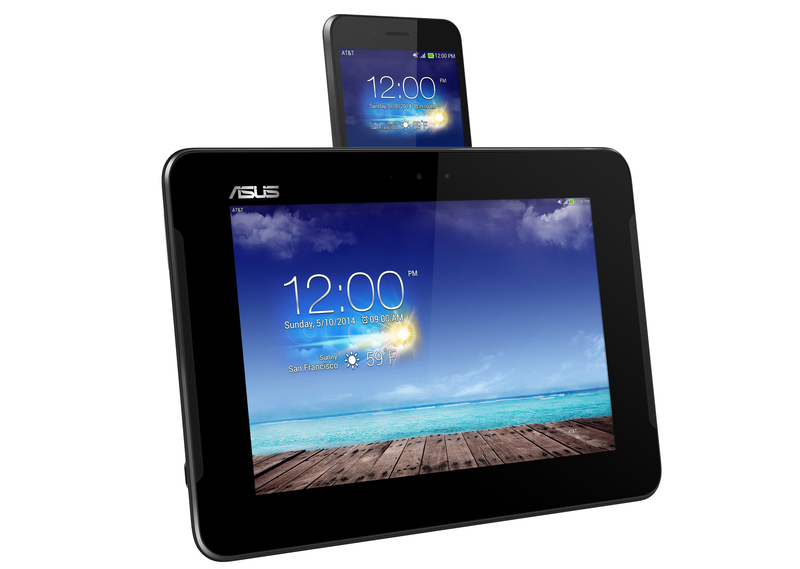 AT&T(s t) announced plans to carry the Asus Padfone X smartphone/tablet hybrid back at CES, but is just getting around to revealing the hardware specs now. The carrier posted new details about the device on its consumer blog. The 5-inch smartphone measures 5.66 by 2.85 by 0.39 inches and weighs 5.29 ounces. It docks into the back of a 9-inch tablet that measures 9.85 by 6.78 by 0.45 inches and weighs an additional 18.1 ounces. That’ll make the tablet a somewhat hefty 23.4 ounces once you dock the phone into it, but the cool thing is that it uses the phone’s LTE data connection, which means you’re basically getting a connected smartphone and tablet for the price of a single data plan. And while the phone itself has a 2300mAh battery, the tablet has an additional 4,990mAh cell, which should provide you with a decent amount of battery life. On the software side, the Padfone X is running Google’s(s goog) Android 4.4 KitKat software. It’s also powered by a 2.3GHz quad-core Qualcomm(s qcom) Snapdragon 800 processor and 2GB of RAM. There’s 16GB of internal storage, along with a microSD card slot for up to an additional 64GB. The phone itself features a 13-megapixel rear camera and a 2-megapixel front-facing camera. That 13-megapixel rear camera will also be put to use when plugged into the tablet body, but there’s a separate 1-megapixel camera on the front of the tablet. AT&T still hasn’t announced any information about pricing or availability. So far, smartphone/tablet hybrids like the Motorola Atrix haven’t really taken off in the U.S. I don’t expect the Padfone X to change that, but for the right price, it looks like it could deliver a good combination of power and convenience for some users. OK here’s the 411. I’m on Verizon now and have the Motorola Atrix dock. ( now a paper weight) I think this padfone x will sale. Here’s why, it’s a tablet form not mini laptop. Better docking for movement and holding, touch screen, faster hardware, better software, your candy crush last level saved(play it on phone now tablet later,) So when this sales goodbye Verizon hello AT&T.